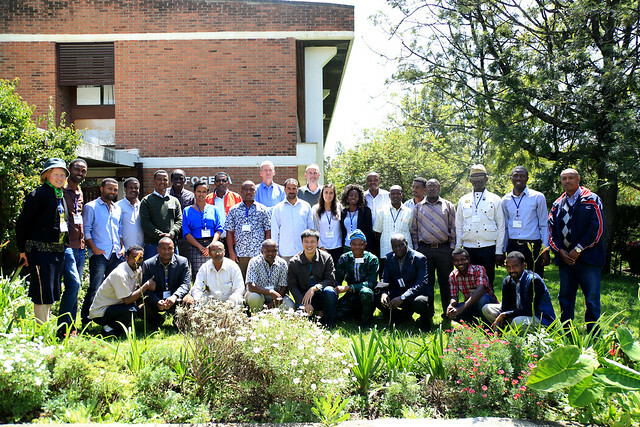 The African Chicken Genetic Gains program recently hosted a one-week training course (28 September-2 October 2015) in Addis Ababa. The course taught participants the elements involved in (poultry) breeding, how to design a breeding program, and how to build a community around it. Two of the teachers (Johan van Arendonk and Hans Komen From Wageningen University) and two of the students (Damilola Osinbowale from Nigeria and Maria Lozano from Colombia) were interviewed to give us impressions of the objectives of the course, their involvement in it and what could come out of it. The teachers, who also included Elise Norberg from Aarhus University, organised the course in such a way that the students could reflect more deeply on ‘how to breed’, recognising at the same time the limitations of short training. The students for this course were selected on the basis of having some animal breeding experience and they were, for the main part, suggested by the ACGG country teams. The other part was open and the course proved quite successful in attracting people in the region. Having this “interesting mix of people with diverse backgrounds” helped bring different views in the course and make the exchange much richer still. The course itself was designed after consulting the different country coordinators of the ACGG project, so as to ensure it met the needs of country team. And the rest was left partly open-ended, as the teachers confessed that “it was difficult to know the level of the students” (beforehand). They developed the program during the course based on the participants and, as much as possible, their needs. Johan van Arendonk explains that specifically: “We started from the general principles and we left enough room for people to come with questions”. This course is very much focused on getting hands-on experience. We call this teaching ‘learning by mistakes’. According to two of the students, the course was indeed extremely helpful as it helped understand all the elements involved in a breeding program, how to do a proper line selection (getting lines of male chickens that have interesting traits and combining these with female chickens to achieve a desirable breed or desirable traits), cross-breeding (between indigenous and exotic breeds), understanding genotype interactions with the environment etc. Applying the course to their day-to-day environment seems almost guaranteed for both Damilola and Maria as they are both PhD students in the ACGG project, but Damilola warned that passing this information to other students would be a challenge. People in developing countries who want to design and develop breeding programs and become breeders themselves, particularly in developing countries but potentially also in developed countries, are welcome to follow such courses. A subsequent course is already in the making and an outline for a follow-up course is being developed. ACGG country coordinators will once again be involved to align the course with their needs. But the hope of the teachers is to “see them back in the next course and realize our ambitions of creating a community of people”. As Damilola shared, “breeding is not easy” so it’s only good news that Arendonk and Komen found the students very motivated and responsive. The few months until the next course will be a good indication whether this motivation and responsiveness is here for the long haul too.